Update: Moose Peterson has an update on the D3s and 70-200 VRII combo. Yesterday B&H shipped their first Nikon D3s. Also yesterday, Mosse Peterson was in New York and also got his D3s and 70-200 f/2.8 VRII lens, so I really think the first batch is already here and shipping. The Nikon 70-200 f/2.8 VRII lens has moved to "accepting orders" status at B&H, which is a clear indication that shipping will start soon. 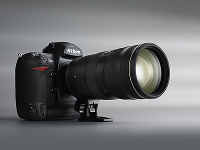 This entry was posted in Nikon D3s and tagged Nikon AF-S 70-200mm f/2.8G ED VR II. Bookmark the permalink. Trackbacks are closed, but you can post a comment.